Shinto : Chujyo-saku ranking : Wazamono cutting test ranking : Settsu province. This Echizen Kami Minamoto Rai Nobuyoshi belongs to Jyo Saku ranking. Habaki : Copper double Habaki. Blade length : 53.6 cm or 21.1 inches. Sori : 1.36 cm or 0.54 inches. Width at the hamachi : 3.24 cm or 1.28 inches. Width at the Kissaki : 2.35 cm or 0.93 inches. Kasane : 0.66 cm or 0.26 inches. Shape : The blade is wide and thick with suitable sori and longer Kissaki nice looking shape. Jigane : Koitame-hada well grained with Jinie attach nice Osaka Jigane. Hamon : Niedeki from the Hamachi and then Gunome-midare with thick Nioikuchi like Doranba Oogunome-midare Hamon. In Hamon, there are Ashi and Sunagasi work. Boshi is round shape with thick Nioikuchi. Echizen no kami Minamoto Rai Nobuyoshi was a 3rd son of first genertation Kyo Shinano kami Nobuyoshi. And his real name was Takai Kinsaburou. He entered the priesthood, and he was called Tomonobu. He was strongly influenced by Sukehiro and Inoue Shinkai. And his strong points are Doranba-Hamon and Suguha with deep Nioikuchi. He has some signature ‘Echizen-no Kami Minamoto Nobuyoshi’ , ‘Nyu-do Minamoto Rai Nobuyoshi’, ‘Takai Echizen no kami Minamoto no Nobuyoshi’. He migrated to Osaka pref in his late life and made Sword at there. 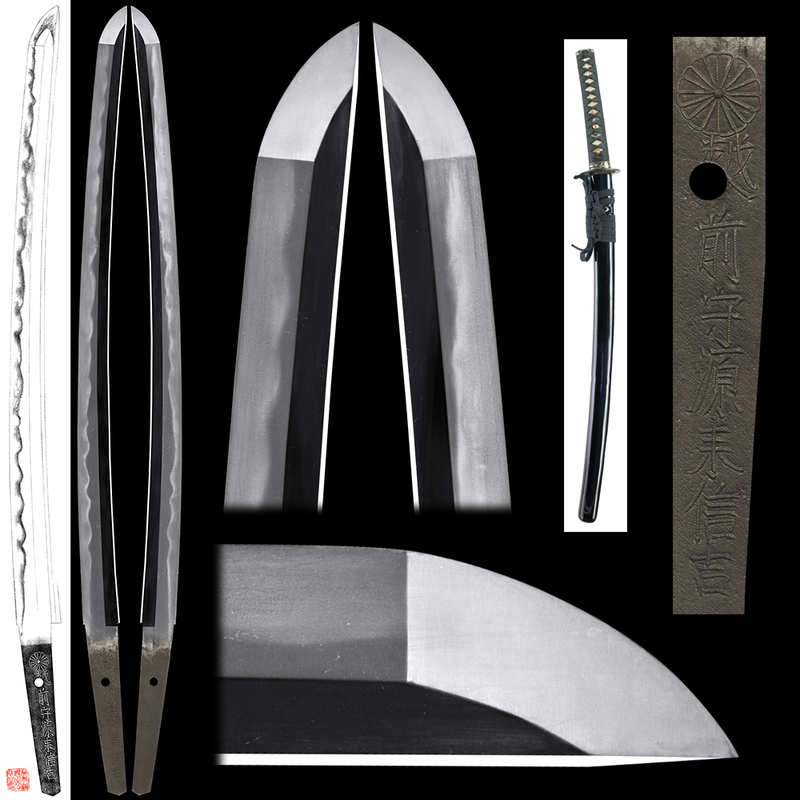 Some his blades in his late life has “Kikumon” and “Ichi” and “Minamoto” in signature. 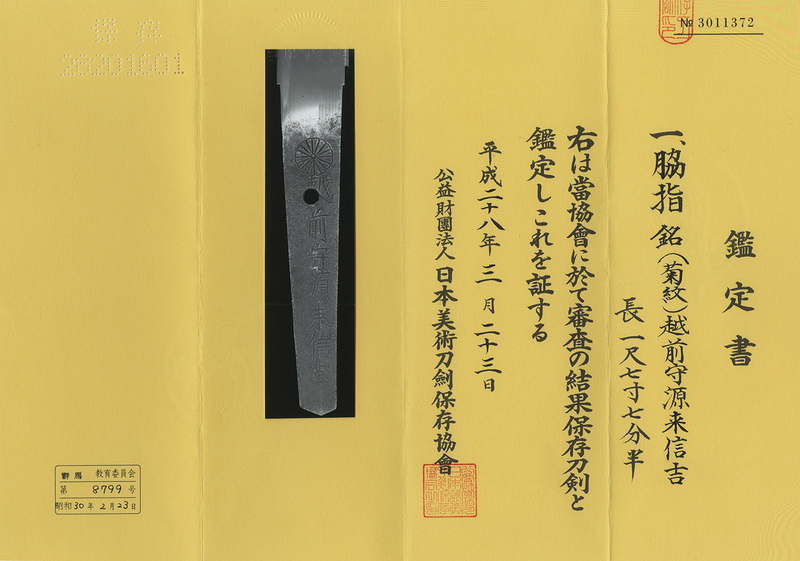 There are “Kikumon” and “Minamoto” in this blade’s signature. This blade has enough potential to pass NBTHK Tokubetsu Hozon Paper in the future. Condition is healthy without any Kizu (flaws). Tsuba : On the round shape iron Tsuba, bamboo screen is engraved open work. Menuki : Figs are engraved on Shakudo plate with gold color. Huchikashira:flower is engraved with gold color. Historical background: 1679 Enpo 7th, Echigo sodo happened at Echigo Takada crane. Shogun Tokugawa ordered very strict ordered to Takada crane　which is called Kaieki (dismissed from the crane and ordered another person will succeed this Takada crane).